Along with visiting The French Pastry School in Chicago, we walked up and down the Magnificent Mile and of course did some eating. 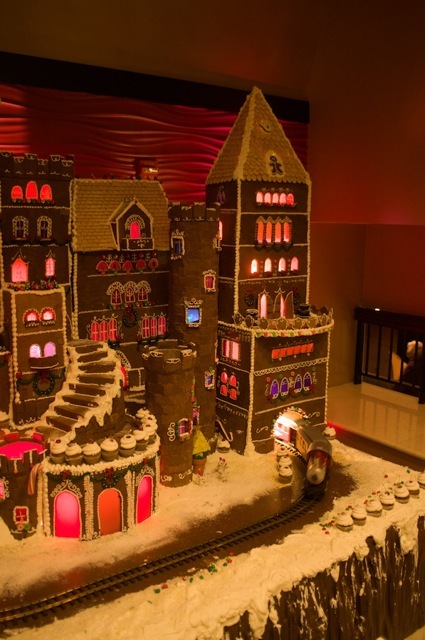 We stopped in at the Marriott on Michigan Avenue to see their gingerbread house. 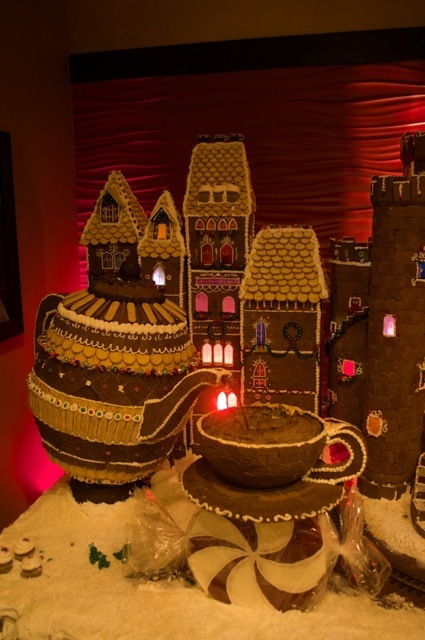 Almost 1000 pounds of gingerbread and a giant teacup pouring chocolate! So big it can’t fit in one photo! If you’re in the neighborhood, it’s definitely worth a stop in at the Marriott. We saw last year’s gingerbread house too, and I was happy that this year’s was on display when we were there. I’m working on a gingerbread house right now and I guarantee you that it looks nothing like this. We interrupt this post for some broccoli! In case I haven’t mentioned it before, I am a broccoli fanatic. I can’t explain it, but I love it. Lunch was a Spinoccoli (spinach and broccoli) pizza at Pizzeria Uno. Just look at all the broccoli in that pizza! 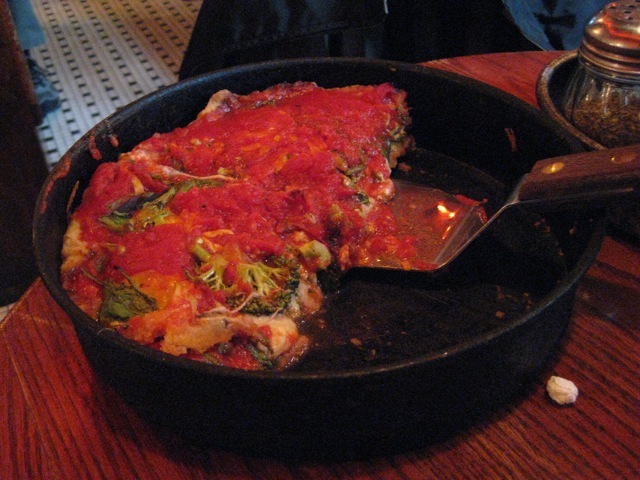 Nothing beats the original Uno’s on Ohio Street in Chicago, and nothing beats a pizza full of broccoli. 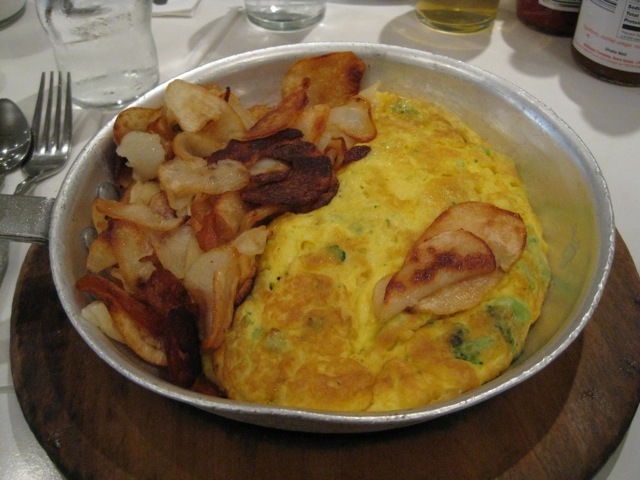 The next day, breakfast-for-lunch was a broccoli and cheese omelet at Lou Mitchell’s. Ah yes, more broccoli. Michele at Veggie Num Nums told me about Lou Mitchell’s. It’s a fun place and the food is fantastic. 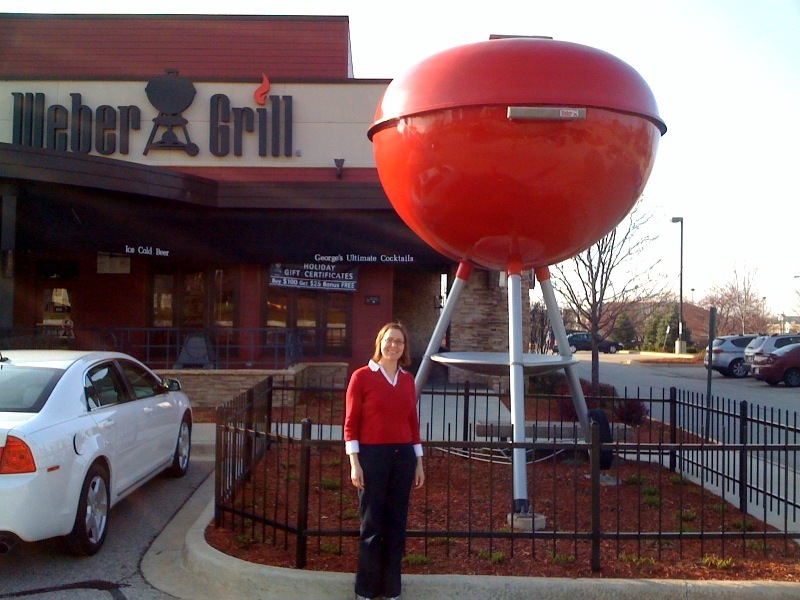 Lunch at the Weber Grill restaurant in Schaumburg was broccoli-free, but it was still good, and you gotta love the giant grill! That gingerbread house is amazing! I’ll look forward to seeing the one you’re making too – sounds fun! I am a broccoli fanatic too, it’s always my go-to veggie when I can’t be bothered to think of anything else. 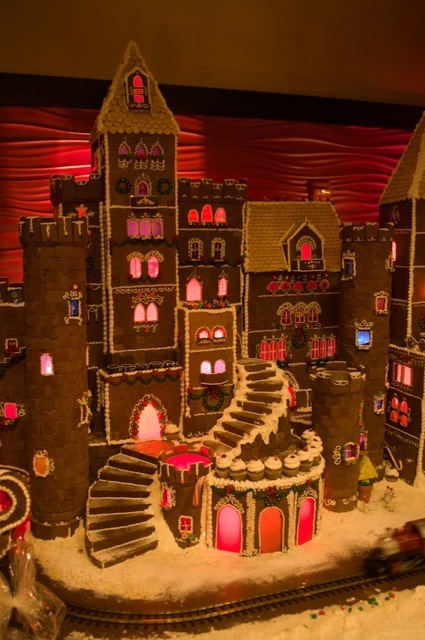 I’m making a gingerbread house too – did I mention it’s larger than the one in the photo? ha ha ha ha ha. Last time I had Pizzaria Uno was in San Diego (California). It was the best pizza I’ve ever had. And I love the photo of the grill. It’s about the right size for my husband. That gingerbread house is amazing! I bet it smelled great, too! Wow, you really DO love broccoli! You weren’t kidding! I love all your Chicago photos! I’m so glad that you had a fun time. There is so much to do there and now I’ll have to try the weber restaurant on one of my visits. Look at that gingerbread house! Phenomenal! Having just attemtped my first house, I can only imagine how much effort went into this. Broccoli pizza – who woulda thought? It looks good though. Is that you in front of the grill? wow! i wonder how they did the cylindrical turrets. wouldn’t you die to make something like that?